Scott Reyburn has a preview of the Frieze auctions, at least, Christie’s Frieze auction which features a Fontana Fine di Dio, this one in black, estimated at £12 million. A Pepto-pink Fine di Dio failed to sell for £8 million in London in June. But a gold one went for a record £10.3 million in February. Over at Sotheby’s the emphasis is on Gerhard Richter. 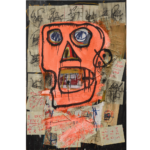 Two Richters, two Warhols, a Basquiat and Hirst medicine cabinet are the top lots at Sotheby’s. Jerusalem is a Richter landscape that’s estimated at £5 to £7 million. This red Abstraktes Bild–a hot run of these paintings has been taking place this year too. The Warhols are a set of skulls estimated at £5 to £7 million and Gold double Mona Lisa estimated at £1 to £1.5 million. Beneath the Fontana in price at Christie’s is couple of Richters too. Claudius, estimated at £6 million.Reyburn has Rachofsky evaluating it as, `fabulous painting at a fair price.” Kerzenschein, the other Richter, is estimated in the £2 ot £3 million range. Christie’s has a Warhol Double Marilyn, at £4.5 to £6.5 million, and Richard Prince’s Dude Ranch Nurse #2, estimated at between £2.8 and £3.2 million. Aside from the Bacon and several Freuds, there’s a de Kooning and a Doig. The de Kooning, estimated at between £2.5 to £3.5 million, is from 1986 and follows the £3.5 million sale of a 1986 canvas at Phillips de Pury in June. For an overview of the Contemporary art sales in London over the last few years, see This Is London. “October will become just as important, if not even more important, than February and June in London,” said Pilar Ordovas, Christie’s head of contemporary art in London. “There are more international collectors in London during Frieze week than at any other time of year.” Ordovas called the selection “the most comprehensive and valuable” autumn sale to date. If the market makes you crazy, there’s still more to be seen and done in London. Kate Taylor’s NY Sun piece focuses on the alternatives.